Well, so when he came over it was a very obvious choice. 2 player Hanabi. I had never played Hanabi two player before, but I had heard that it works and that was enough for me. So we played, and played, and played. 5 games in total. For the game of 25, it was quite evident to me somewhere pass the halfway point that we were going to make it. We had our 5s in our hands and knew exactly which ones they were. We had saved the cards we threw away early, and whatever we still needed all had their multiples of 2 intact. So unless we had some really really bad stacking of cards, or made horrendous complacent mistakes, there was no way we were not hitting 25. So that brings me to the good and bad of 2 player Hanabi. First the bad. A bad stacking of the deck will totally throw your game off. 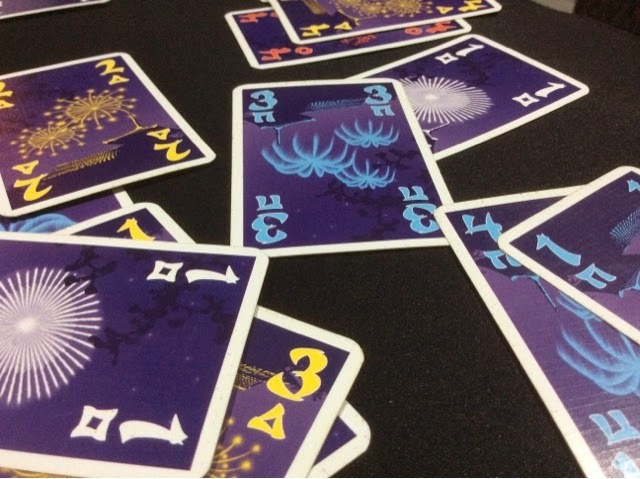 If the last card was the one 2 you needed, then you will never get higher than 2 points for that color of fireworks ( person draws the 2, and his/her next turn is the last turn ). This is also true for a 3 or more player game, but, in a higher player count game, the chances of you throwing a card you needed away is less likely. In a 2 player game, it comes to the point where sometimes you have to throw cards to refresh your hand and get a playable card. In 2 of our games, we started our hands with a bunch of 4s and 5s. So throwing them was a necessity. This makes the 2 player game tough when the deck is against you. You have to throw and hope that the other card of the pair comes out soon enough ( especially when it's a small number ). Failing which, you are always playing on the back foot trying to keep cards and find the one throwable card in your hand. Next bad, you better find a player who is as good as you. When there's just the 2 of you, if your friend is a nitwit, you're gonna get real mad real soon. Haha. I like this friend though, he's got a good analytical mind. And he pays attention to stuff. So that was a good thing. 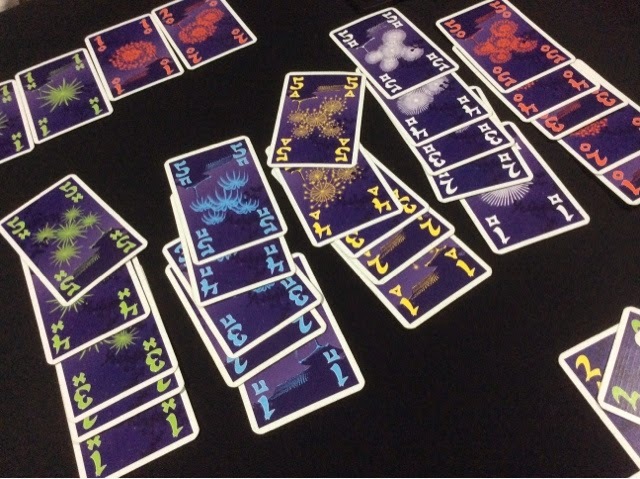 As for the good in 2 player Hanabi, well, I think there is much more avenues to give creative hints. Because the turns go you me you me, you can tell a hint that is still relevant when it's the player's turn. Like, the game state will not have changed to the point where your clue has become partly redundant. Also, if the 2 players a creative and in sync, you can give 2 hints in 1 with the right reading of the person's mind. Like if you know the personality of the person ( say he's a gambling man ), then you can feel free to give a hint of chances and leave him to his natural devices. But with more players they is much groupthink and the reluctance to take a chance. 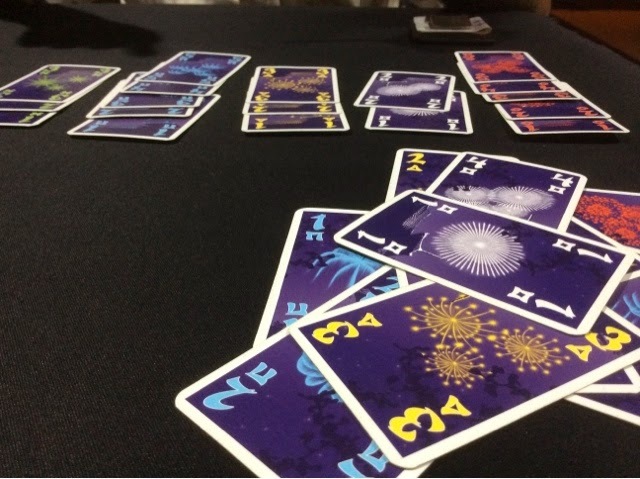 Chances also run higher in 2 player Hanabi because you are trying to get rid of cards to get new ones, so sometimes taking a gamble is worth the risk as it really brings you much closer to the finish than when you have more players. 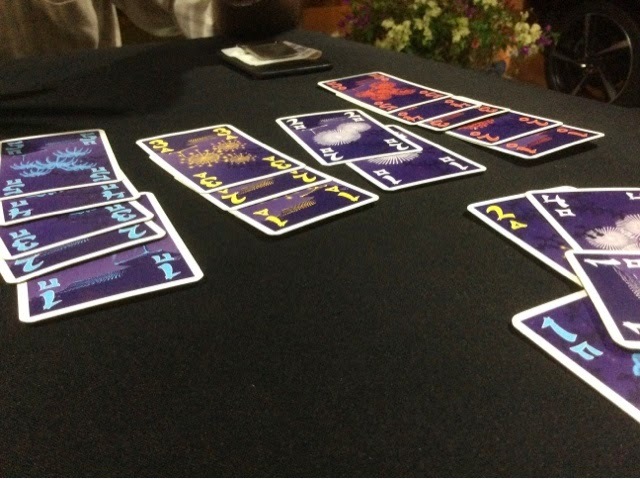 Overall I think I would definitely play 2 player Hanabi again. It was my 2nd perfect game and though I don't always look for a perfect game, I think the dynamics in the 2 player game is pretty refreshing as compared to the other player counts of Hanabi. I've been very into getting this game out with 2 players. I can teach it in 5 mins and even new comers can be competitive from the get go. He was new to this so I let him play the assassin and me the king (again). This time I failed when I was really close to the gate. 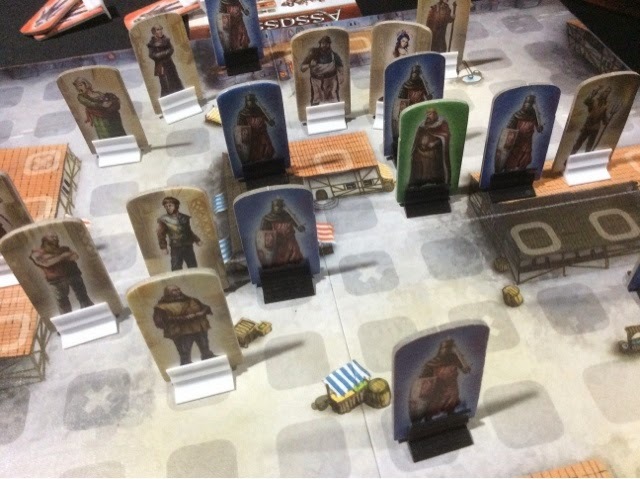 I needed about 2 more turns but I had eyed the wrong people all along. He hid his assassins very well and masked 2 of them till the very end. I had killed one after taking a wound and I misjudged the last two to my own detriment. I played side B this time round and it seems a little friendly to the king player as you have slightly more moves to get to the castle so you can delay a little bit longer than side A. I like how the map was more open to the assassin player as well. For awhile he had me surrounded with a mob and deciphering who was who was terribly difficult. I had very little arrest icons early in the game so that made things slightly difficult as well. Overall a very quick and satisfying 2 player game. 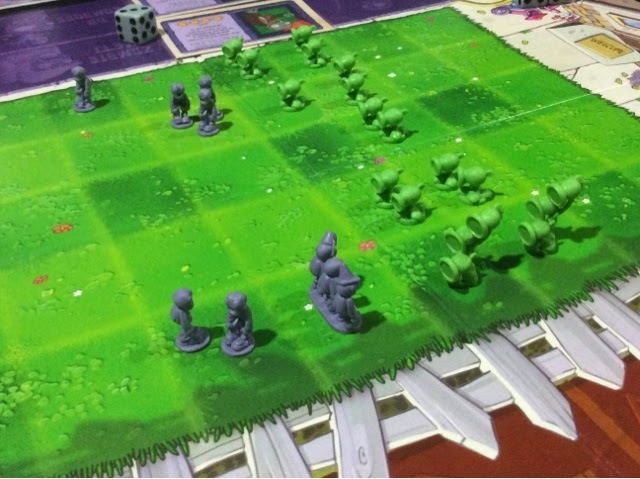 Last for the night was a Christmas gift from Eric - Risk: a Plants vs Zombies. We played the skirmish mode ( which is the only mode I am interested in. not a fan of risk at all ). I was the plants and my friend the zombies. It was both of first time playing this so we just went in clueless trying to see what it offered us. The skirmish mode is in a way a resource management mini game. You are trying to utilize your minimal resources and place them strategically so that they are used most efficiently. The map is like the video game where you have rows in a lawn and the zombies are marching down trying to sack your home. Each player rolls two dice that determine how many actions you can take and how many pieces you can place on the map. From there, the zombies move and take actions, and the plants sit there and fire away. Plain and simple. Everything is settled via dice rolls. There are one time abilities that you get from cards in your deck and also ongoing abilities from cards that you have to buy. The money comes from the cards with one time ability though, so you have to decide of you are gonna use the card for its ability or for its money value. Overall, I loved the theme of the game. It felt like the video game on a board. The playing pieces are excellent. And the look and feel is very well done. The gameplay is however a little too simplistic. I like simple games but there isn't much strategy here. 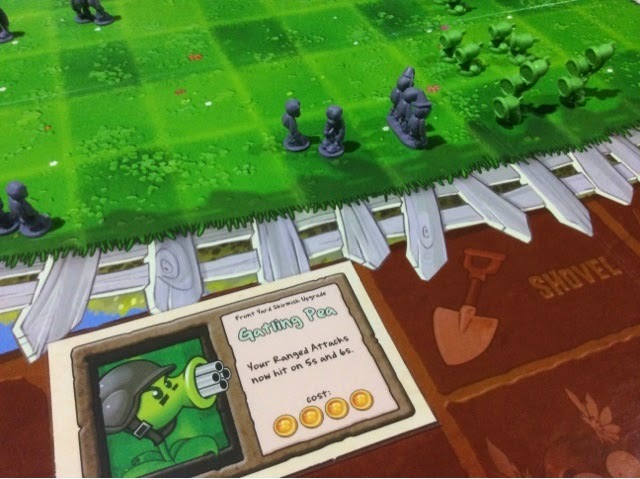 The zombie player is trying to rush down the lanes ( usually just one lane ) and the plant player is trying to roll well to shoot and fend them off. That's about it. I was very badly burned by poor dice rolls. I kept rolling 2 threes or 2 ones while my friend was rolling in the fives and sixes. So the game was pretty much decided there. However that being said, the theme was sufficient for me and the abilities made things slightly different and interesting. It has a short play time ( about 20 mins ) and I think I would play it again just because of that. I think it will appeal to many non gamers and that is exactly who I will likely table it with. It looks great on the table and I think of it as a very light hearted come and get me kind of game ( if you're the plant player ). We were actually laughing and cheering the poor dice rolls and seeing the zombies rush to the "finishing line" was for some strange reason highly amusing. Haha. It is what it is, a brainless game. Thus, a good way to end the night. Wow 25 on 2-player Hanabi! Achievement unlocked! If I am ever going to buy, I will only play it at my place, as a showpiece. The normal version will still be carried around in my deck box but now I wonder if the sleeves large cards will fit inside the box though.